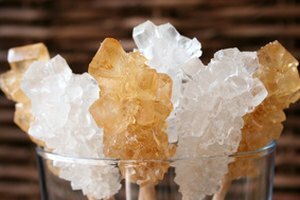 Rock candy is a simple sweet made from sugar and water. It is one of the oldest-known candy recipes and requires very few supplies to make. 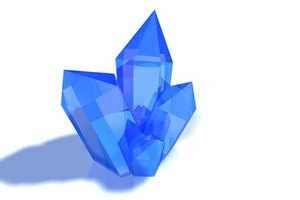 The crystalline, or rocky, appearance of this treat is what gives it its name. This distinctive physical feature is caused when sugar crystals form around a stable stick or string. 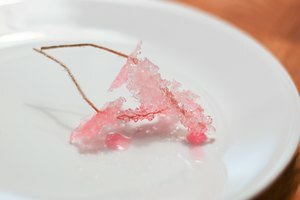 Ordinarily, rock candy recipes call for granulated sugar and water. However, brown sugar may be easily substituted for white. 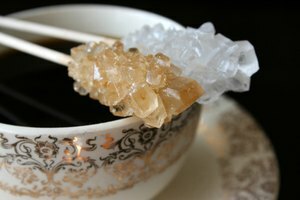 The resulting rock candy will have a slight difference in taste caused by the molasses in the brown sugar. Warm 2 cups water over medium heat until it is boiling gently. Measure brown sugar in a dry measuring cup. Pat the sugar in the cup with your finger tips to remove excess air, and then add more sugar to fill the cup. Measure 4 packed cups. 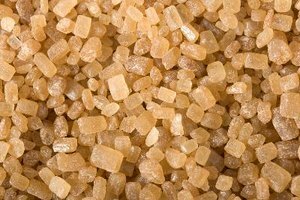 Pour the brown sugar into the hot water, and stir with a wooden spoon until all the crystals have dissolved. 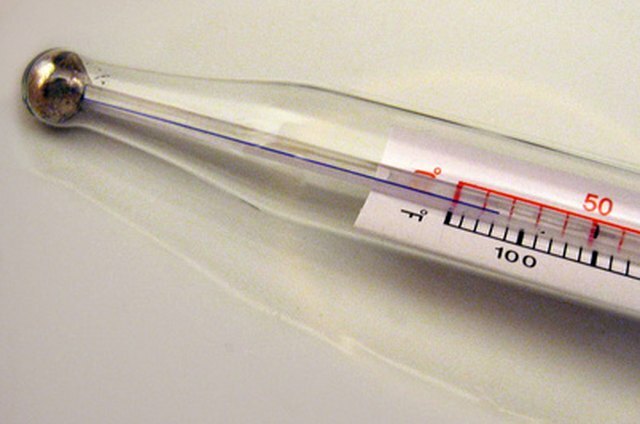 Remove from heat when the mixture is at a rolling boil or when a candy thermometer reads 247 to 252 degrees F.
Transfer the hot sugar solution to a clean glass container, such as a canning jar. Tie one end of a cotton string to the middle of a pencil. Tie a washer to the free end of the string to weigh it down. Dip the string, washer-end first, into the jar of sugar water for five to 10 seconds. Remove the string, and dry it on a piece of parchment paper for two to three days; this creates a layer of starter crystals. Suspend the prepared string in the remaining jarred sugar solution; the pencil balances across the top of the jar and prevents the string from falling into the mix. Do not disturb the jar for seven to 10 days; the candy crystals take longer to form in unstable or humid environments. Remove the candy from the jar. Rinse it for one or two seconds under cool water, and set it on parchment paper to dry. 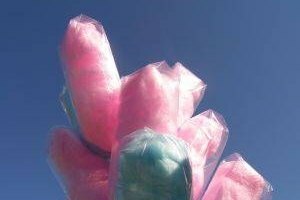 To alter the flavor and color of your candy, add extracts or food colorant. Shape the dipped string while wet into the desired shape of the finished candy. You can make rock candy hoops, swirls or question marks.